DR. BIDEN: So good afternoon. It’s so wonderful to be here with all of you today. And let me start by thanking Sheila Casey, a true friend and champion for all military families, including mine. Thank you, Sheila, for your kind words and support over the years. It’s been a pleasure working with you and your husband, General Casey. Well, it’s hard to believe that after five years, this is our last Joining Forces event. I remember the moment eight years ago, backstage in Springfield, Illinois, when Michelle and I decided we wanted to focus on this important issue together. It was that exciting day when then-Senator Obama announced that my husband Joe would be his running mate. Michelle turned to me and asked what would I like to work on if we won. And I told her that I wanted to tackle the issues that our military families were facing, and she said, “Me too!” (Laughter.) For me, I couldn’t think of anything more fulfilling than serving those who have sacrificed so much for our country. Back in 2008, the wars in Iraq and Afghanistan were going strong. Hundreds of thousands of our troops were deployed. So I called the National Guard and said I wanted to help the families of military families whose loved ones were serving overseas. They connected me with Delaware Boots on the Ground, which was helping to match the everyday needs of our military — they’re here, that’s why it’s making me so emotional — to match the everyday needs of military families with folks who could provide the service. If you need a tire changed, Boots was there for you. If you had a leaky roof, Boots was there. If you needed diapers or a new crib, Boots was there again. Delaware Boots on the Ground made such a big difference for military families in Delaware that Governor Ruth Ann Minner declared on July 4th, 2007, Delaware Boots on the Ground Day. Remember guys? And after we were elected to the White House, I wanted to keep going. I wanted to keep doing all the things that I could for military families — not just in Delaware, but all across our nation. Because, like Michelle, I had been so inspired by the military families, the incredible military families I had met and gotten to know over the years. That’s why, when we called upon you to help us shine a light on our military families, we wanted to raise awareness of the challenges that they confront and still confront that most Americans never have to face or can even imagine. Sending loved ones into harm’s way. Enduring countless separations during training. Starting over on different bases in different towns again and again. All of you in this room, from the veterans and military spouses we met eight years ago on the campaign trail to the nonprofits, schools, foundations, businesses, associations, civil servants and Americans of every stripe, have been with us every step of the way since we launched Joining Forces. You have been our lifeline to our military families. You’ve helped us better understand the unique challenges that they face. You’ve been critical in helping us find solutions to better support those amazing families. You’ve helped us remind folks that we can all make a difference, not just in word on Veterans Day or Memorial Day, but with good deeds and best efforts each and every day of the year, by doing what we do best. And one of the first groups that Michelle and I partnered with to launch Joining Forces five years ago was the National Math and Science initiative. Thanks to NMSI’s college readiness program, we’re helping to ensure that students at 200 military-connected schools in 33 states across the country are prepared for the rigors of college and a career. I’d also like to thank the media, who has helped us share the story of the military family. And that includes everyone from Elmo and “Sesame Street,” to “Reading Rainbow” with LeVar Burton, who have shined a light on military-connected children, as well as the History Channel, which has lifted up our veterans, servicemembers, and their families. And I’d especially like to thank CEO of History Channel, Nancy Dubuc, for being here today. All of you have stepped up for our military and their families in your own unique ways. That’s what you do. And that’s why you’re here today. Because Michelle and I want you to know just how much we appreciate everything that you’ve done and everything that you will continue to do to support those who serve our country. And we all need to keep doing this work, because our military families will continue to serve and sacrifice. Our men and women in uniform will continue to deploy. Their spouses and children will continue to move from base to base, and eventually they will transition to civilian life. That’s why this work matters. And we have to show them that we have their backs. You know, I believe we couldn’t have asked for a better champion for our military families than Michelle Obama. (Applause.) I know you all feel this. She is a woman like no other. (Applause.) Whip smart. Passionate. Loyal. For our nation, she’s been a true role model, especially for young girls. She’s raised two amazing girls on her — of her own whose potential has no bounds. And she’s shown the same warmth and care for her girls that she has with our grandchildren. And from day one, Michelle was determined to make a real and lasting difference in the lives of our military and their families — measurable action, not just words. She has had the courage to take on veteran homelessness, making the seemingly impossible possible. (Applause.) Naturally, freely, warmly she brings joy and hope often simply through a hug to the deployed caregivers and wounded warriors. MRS. OBAMA: Oh, my goodness. (Laughter.) This wasn’t supposed to be tearful. (Laughter.) Oh, wow, look at you all. What an evening, what a day. MRS. OBAMA: We love you all. We love you all more than you can know. (Applause.) This community has kept us going through a lot. So let me just start by, of course, recognizing my partner in crime, Jill Biden, for that introduction. Oh, my goodness. (Applause.) Jill has been, by far, the best partner I could have ever imagined, not just for the work on Joining Forces, but our families have joined forces in so many ways. I’m just grateful to have her by my side. She’s been a devoted advocate for our military community long before she ever came to the White House. This is her cause, as you can hear from her words. This is her mission. And her passion has really been at the heart and soul of Joining Forces from the beginning. Just looking out over this room, so many of you have been with us right from the very beginning, way back in those early days when Jill and I were just starting to figure out what Joining Forces would look like. And back then, we’d get together with military spouses, and Blue and Gold Star families. We’d talk to veterans, and of course we talked to troops. And we’d ask the simple questions: How are things going? Do you have the support that you need? What can we do to help? And, as Jill said, we continue to be blown away by your honesty and your courage, your sacrifice, your service, moving your families across the country, across the globe every few years, enduring deployment after deployment, struggling to maintain your careers and care for your family — I could go on and on. You keep us from complaining about anything. And I know that some of you were probably a little skeptical of us at first. Some may have wondered, how are these two with almost no budget going to make a difference? (Laughter.) And rightfully so, wondering would this just be another PR campaign? Because you had seen plenty of tributes and parades and memorials, all of which are very important, but nowhere near enough. As I said earlier today, talk simply is not enough. So Jill and I knew it was time to act, and that’s why we decided that the only measure of our success would be whether you all could see and feel a concrete difference in your lives. That was the only thing we cared about. So in 2011, we issued a call to all Americans to step up and serve our military community as well as you all have served this country -– not just with kind words, but with real resources, with real support. And as we told you, people answered that call time and again. And that’s what you should know about this country. Just when you wonder whether we’re crazy — (laughter) — we’re not. We’re good people, all over the place. Know that about this country. (Applause.) We are made up of good people. Governors and legislatures in 50 states, all 50 states, took action to help military spouses transfer their licenses and continue their careers as they move from state to state — simple ask. I think there were only two when we first started. And we were like, hey, can we get this done? Folks were like, yeah! And working with mayors and local officials, as we celebrated earlier today, we have ended veteran homelessness in cities and states across this country, housing 354,000 homeless veterans and their families. (Applause.) We did that. We did that. Through wonderful VA programs, we’ve worked to cut veterans’ homelessness nearly in half. And we did that in just a couple of years. That’s just some of what Joining Forces has been able to accomplish, and it’s because of you. Jill and I, we just ask, and then we wait for the press conference. We come in and we go, look what we did! (Laughter.) But we are so incredibly proud of you. You want the country to see this. This is America. And Jill and I, we are so grateful for everything you all have done. MRS. OBAMA: That’s my hype man back there. (Laughter.) Because for everything we’ve accomplished, we also know that every day, people across America thankfully are signing up to put on our country’s uniform, and so many others hang it up for good and join the ranks of our veterans. So our work is nowhere near finished. And it never will be. So my main message to all of you today is let’s just keep this going. Let’s keep it going. (Applause.) Plain and simple. (Applause.) We don’t get all of this done in such a short period of time and just not keep pushing. And to our servicemembers, our veterans, and to our military families, I urge you to never settle for anything less. This effort, it hasn’t been perfect. We haven’t achieved every goal. We haven’t righted every wrong. But believe me, from now on, this should be the baseline. This should be the minimum level of support our military should feel from their White House all the way down to every community in this country. (Applause.) They should feel it from the President and the Vice President, from the First and Second spouses on down to the VA, to VSOs, to schools, to hospitals, to congregations, to citizens. That’s true regardless of who is in charge or what party they belong to. Because this issue has nothing to do with whether you are a Democrat, a Republican or an independent. It is so much bigger than that. It’s about supporting our American heroes. (Applause.) And it’s about standing up for who we are as a nation. And that’s something we can all agree on. There should never ever be any daylight between any of us when it comes to that. So you all need to work with the next administration to continue these efforts. Whatever it is that you’re working on, I want you to find new partners in the next administration. I want you to work with them just like you worked with us on the issues that matter most to our military community. And I want you all to know that while today might be our last time together here as First Lady — and I hate to say Second Lady, because there’s nothing second about Jill — (laughter and applause) — but we are not saying goodbye. This is not the end. Jill and I intend to keep working on this issue for the rest of our lives. (Applause.) We will figure out a way to use whatever platforms we have next. And with your help, we know that the spirit of this movement will live on. We will continue to find ways to be supportive long after we leave the White House. This movement will live on. It will live on in every military spouse who steps up and says, I’m tough, but even I can’t do this alone, and every Governor who responds, you don’t have to. It will live on in every veteran looking to bring their skills and their training to our workforce, and every CEO who gives them that chance. It will live on in every servicemember who knows their spouse is being supported during their deployment, and every teacher who goes that extra mile to make sure their kids feel welcome in a new school. This effort is going to live on because it belongs to each of us and to every American who joins forces to support America’s heroes. So instead of saying goodbye, I want to end as I started — by once again saying thank you. (Applause.) This has been one of the greatest pleasures of my life, getting to know this community. We are grateful. We are grateful. And we have so much to feel grateful for in this country. Let us never forget that. 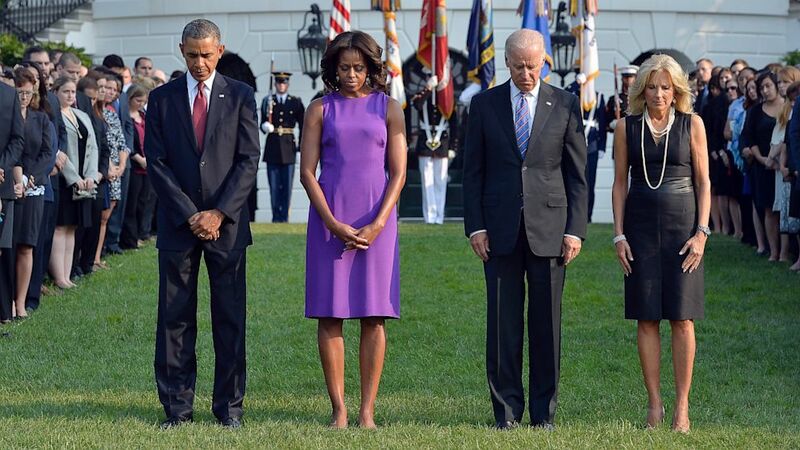 President Barack Obama, First Lady Michelle Obama, Vice President Joe Biden and Jill Biden observe a moment of silence to mark the 12th anniversary of the 9/11 attacks on the South Lawn of the White House in Washington, DC, Sept. 11, 2013. Secretary Hagel, General Dempsey, members of our Armed Forces and most of all, the survivors who bear the wounds of that day and the families of those we lost, it is an honor to be with you here again to remember the tragedy of twelve Septembers ago — to honor the greatness of all who responded and to stand with those who still grieve and to provide them some measure of comfort once more. Together we pause and we pray and we give humble thanks — as families and as a nation — for the strength and the grace that from the depths of our despair has brought us up again, has revived us again, has given us strength to keep on. We pray for the memory of all those taken from us — nearly 3,000 innocent souls. Our hearts still ache for the futures snatched away, the lives that might have been — the parents who would have known the joy of being grandparents, the fathers and mothers who would have known the pride of a child’s graduation, the sons and daughters who would have grown, maybe married and been blessed with children of their own. Those beautiful boys and girls just beginning to find their way who today would have been teenagers and young men and women looking ahead, imagining the mark they’d make on the world. They left this Earth. They slipped from our grasp. But it was written, “What the heart has once owned and had, it shall never lose.” What your families lost in the temporal, in the here and now, is now eternal. The pride that you carry in your hearts, the love that will never die, your loved ones’ everlasting place in America’s heart. We pray for you, their families, who have known the awful depths of loss. And in the quiet moments we have spent together and from the stories that you’ve shared, I’m amazed at the will that you’ve summoned in your lives to lift yourselves up and to carry on, and to live and love and laugh again. Even more than memorials of stone and water, your lives are the greatest tribute to those that we lost. For their legacy shines on in you — when you smile just like him, when you toss your hair just like her, when you foster scholarships and service projects that bear the name of those we lost and make a better world. When you join the firehouse or you put on the uniform or you devote yourself to a cause greater than yourself, just like they did, that’s a testimony to them. And in your resilience you have taught us all there is no trouble we cannot endure and there is no calamity we cannot overcome. We pray for all those who have stepped forward in those years of war — diplomats who serve in dangerous posts, as we saw this day last year in Benghazi, intelligence professionals, often unseen and unheralded who protect us in every way — our men and women in uniform who defend this country that we love. Today we remember not only those who died that September day. We pay solemn tribute to more than 6,700 patriots who have given their full measure since — military and civilians. We see their legacy in the friendships they forged, the attacks they prevented, the innocent lives they saved and in their comrades in Afghanistan who are completing the mission and who by the end of next year will have helped to end this war. This is the path that we’ve traveled together. These are the wounds that continue to heal. And this is the faith in God and each other that carries us through, that restores us and that we summon once more each time we come to hallowed ground — beside this building or in a Pennsylvania field or where the towers once stood. Here, in such moments of grace, we are renewed. And it is here that we reaffirm the values and virtues that must guide us. Let us have the strength to face the threats that endure, different though they may be from 12 years ago, so that as long as there are those who would strike our citizens, we will stand vigilant and defend our nation. Let us have the wisdom to know that while force is at times necessary, force alone cannot build the world we seek. So we recommit to the partnerships and progress that builds mutual respect and deepens trust and allows more people to live in dignity, prosperity and freedom. Let us have the confidence in the values that make us American, which we must never lose, the shining liberties that make us a beacon of the world; the rich diversity that makes us stronger, the unity and commitment to one another that we sustain on this National Day of Service and Remembrance. DR.BIDEN: Hello, everyone. Please sit. Good afternoon, everyone. Thank you for being here and it’s wonderful to welcome you to the White House. Many of you know I’m a proud Blue Star mom. My son, Beau, is a soldier in the Delaware Army National Guard. So while I’m always honored to be in the presence of our military families, I feel a special bond with other military moms. I’ll never forget the day that Beau deployed to Iraq. It was that mixture of pride and concern that military moms know all too well, right? Having Beau overseas was a tough year for our entire family, but it was especially difficult for my daughter-in-law Hallie, my granddaughter Natalie and our grandson Hunter. There were a lot of people who stepped up in different ways to support our family that year. A neighbor shoveled the driveway during a snowstorm. Our church included Beau’s name in the church bulletin. And at Natalie’s school, her teacher hung a photo of Beau’s unit on the wall so that everyone would know that Natalie’s daddy was away. Through the whole experience, these acts of kindness meant so much to them and to us. While our sons and daughters serve so selflessly having a community share the burden makes all the difference in the world. Today I am here to say thank you for all that you do, for your selflessness and for your sacrifice on behalf of our country. MRS. OBAMA: Thanks so much. Well, everyone, welcome. Thank you. Thanks, Jill. Thanks so much for that gracious introduction. But, more importantly, thank you for being such a phenomenal military mom and such a spokesperson for military families. You’ve been just a great partner in Joining Forces and everything we do. And I’m just grateful to have you as a friend and as a partner. Well, welcome. I hope you guys are doing good, having fun — everything going well. So far, so good? That’s good. (Applause.) Well, we’re happy to have you here. And I want to start by recognizing a few people. I want to recognize Patty Shinseki, who is also a dear friend. Patty, where are you? Are you here? Patty is right there. (Laughter.) Patty, wonderful to see you. Thank you for being such a tremendous supporter of both Jill and myself, and for all the sacrifices that you make. I want to recognize Lilibet Hagel who is here. Please stand, the both of you. (Applause.) Thank you, as well, for your service to this country and for all that you do for Jill and myself as well. And I want to take a minute to embarrass somebody in the room, because I have a special person here as well — a woman who is my rock in so many ways. I couldn’t do what I do every single day if it weren’t for this woman. I just did an interview the other day where somebody asked me what was one of the most important things that my mother taught me — and I could go on and on and on. But my mom has taught me most to be a good listener, to be patient, to use common sense. She has taught me to be open-minded. And what she still does for me today is that she will give me endless amounts of time just to talk and talk and talk and talk — and all she does is listen. (Laughter.) That’s all she does, is listen. And sometimes that’s all we need. And finally, I want to thank all of you for being here today as we celebrate Mother’s Day at the White House. It’s really good. We’re doing it just a little bit early, so get double duty, moms. (Laughter.) We get today and we get tomorrow. Let’s stretch this out. (Laughter.) We get Saturday, Sunday — and I think we should just figure out what we need to do on Monday, too. (Laughter.) So I think this is a good way to start off the weekend. Today, we have some of the most extraordinary moms in the country with us. We have active duty troops and veterans and military spouses from all across the country. And we knew we wouldn’t be celebrating motherhood properly if we didn’t have you guys bring along some special guests — your children — and some people have brought their own moms as well. So this is quite a beautiful crew — and handsome, too. (Laughter.) So we are thrilled to have several generations of families here with us today. We also have a group of very special women who I’d like to take a moment to recognize — some of the Military Spouses of the Year from each branch of our Armed Forces. And as I say your name, please stand so that we can recognize you. Verenice Castillo from the Air Force. (Applause.) Stay up. (Laughter.) I want you to get your moment. Tara Crooks from the Army. (Applause.) Karen Guenther from the Marine Corps. (Applause.) Shelley Kimball from the Coast Guard. Alisha Youch from the Navy. (Applause.) Where’s Alisha? MRS. OBAMA: Well, give her a hug from us. Those are Alicia’s words. And that’s what military moms do every day. You all help people soar. You help our country soar. When somebody needs you, whether it’s your family, or your community, or your country — you lift them up. You answer the call every single time. You find a way to fit that meeting into your calendar — which is why Alicia is gone — (laughter) — or stop by that neighbor’s house on the way home to lend a hand. And even though you’ve got families to raise and jobs to do all your own, you never complain. And Jill and I say this all the time, as we meet with thousands of military families — you all just never complain. Never complain. You just keep moving along, getting it done. And I hope that you know how much your country appreciates you. I really hope you do. 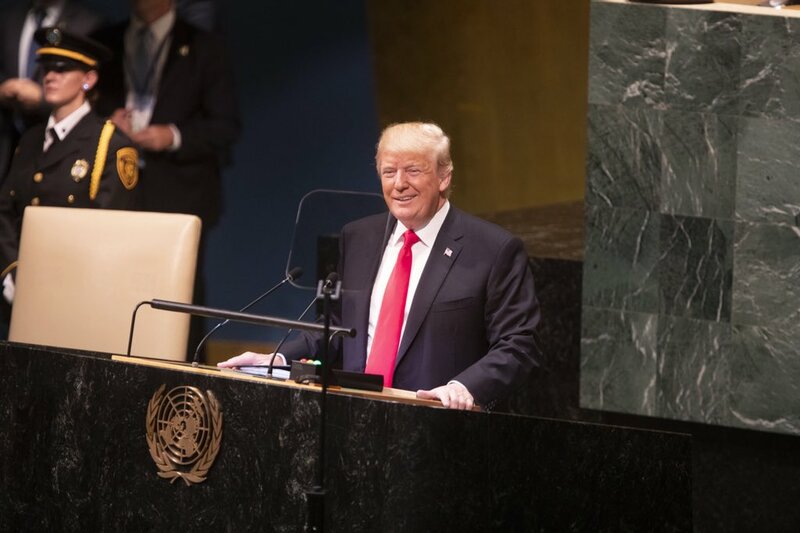 I hope that you know that people across America have your backs, from everyone here at the White House and the Department of Defense to CEOs of some of the largest companies in this country, to doctors and college professors and community and faith leaders in cities all over this country — people are responding to your service with service of their own. And that’s why Jill and I — one of the things that we’ve seen as we’ve been working with Joining Forces over these past several years — every time we’ve issued a call to action on your behalf, whether it’s for jobs or educational opportunities or volunteers to do more for you, Americans have responded overwhelmingly, in such positive ways. We haven’t had a single person tell us no when we’ve asked. I mean, that’s what we’ve learned. A lot of times when people don’t step up, they don’t know — they don’t know what to do. But when we explain, when we share, when we ask them to do it, they step up. And I know that’s not just because Jill and I are asking. I mean, we’re cool and everything, but — (laughter) — but it’s really because of all of you and everything your families have given to this country. 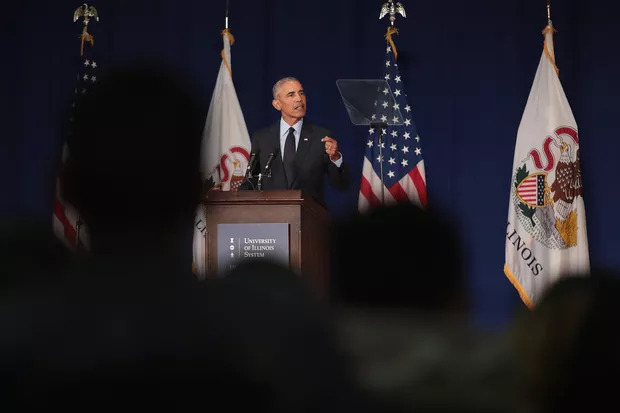 So I want you all to know that this country is here for you and your families now and in the years ahead — because everything we’re doing with Joining Forces isn’t about the Obama administration. The goal is that this is a forever proposition, that anyone who occupies the White House from now on will take this mission up as a primary focus of everything they do. All of these changes we hope to be part of the bureaucracy from now on. So that’s what Joining Forces is all about, and that’s what today is all about. So we really do want you to make yourselves at home. When the lights go off and all the cameras leave, it’s just tea with us. (Laughter.) Eat all you want. As I say, have all the cookies you want. (Laughter.) Today is the day to forget about Let’s Move. This is the balance part of it. (Laughter.) We’ve earned it, moms. (Laughter.) We can have our cookies. And we’re going to walk out, Jill and I, for a second. And we’re going to ask all the young people in the room to come with us because we’ve got some surprises for you. So we’re going to leave, do a little business, and we will be back for a few surprises for you all. So, moms, hold tight. You get a couple of minutes of free babysitting. (Laughter.) So any kids who are ready who want to leave and come with us, you guys follow us. We’re coming. We’re going to march on out. Let’s go. MRS. OBAMA: Well, surprise! (Laughter.) You guys, your kids will be coming in, they’re going to find their places. They’ve been working so hard on some special surprises. You all, please, be seated. Well, it is my honor to welcome Prince Harry to the White House today. As you all might know, Prince Harry is a Captain in the Army Air Corps in the British Armed Forces. (Applause.) In January, he returned from his second deployment to Afghanistan, and for the past few years he has focused on honoring the sacrifice and service of our veterans and military families, especially now that the war in Afghanistan is drawing to a close. He has spent much of his time supporting our wounded warriors and the families of our fallen. And this weekend — absolutely. (Applause.) And this weekend, he will be attending the fourth annual Warrior Games in Colorado Springs. So we are absolutely thrilled that he could be with us today, that he took the time. He just arrived in D.C. and only has a limited time with us because he has a very busy schedule. But when he heard about this tea and all of you — as I said, when people know about you and the sacrifices you make, they want to be a part of it — he wanted to be here to personally thank you for your service. So we are going to head into the Blue Room — Jill, Prince Harry and myself — and we’re going to take time to greet each one of you. So Prince Harry is going to stay as long as he can, and our goal is to get through everyone. But as soon as he — whenever he has to leave we’ll pull him out, and Jill and I will be here to the very end. The First and Second Ladies of the United States got an early start on the 2013 Inauguration celebrations at a concert honoring our military families. The Kids Inaugural Concert: Our Children, Our Future was hosted by Nick Cannon and featured artists including Katy Perry, Usher, the cast of “Glee,” Far East Movement and Mindless Behavior. JR Martinez, the Army hero who won “Dancing with the Stars,” also joined Mrs. Obama and Dr. Biden for the event, which was held at the Washington Convention Center. Dr. Biden said the concert was a chance to show military kids how much the country appreciates the sacrifices they make while their parents are serving. I have to tell you that my very favorite part of this entire weekend is being right here with all of you. Absolutely. Because for me, this is what inauguration is all about. It’s about celebrating who we are as Americans and all the things that make this country so great. And when I think about who we are, when I think about what makes America great, I think about all of you –our men and women in uniform, our military spouses, and our amazing military kids. The concert was held in support of Joining Forces, the initiative launched by Mrs. Obama and Dr. Biden to mobilize all sectors of society to give our service members and their families the opportunities and support they have earned. DR. BIDEN: Hello, everyone! (Applause.) Thank you for that wonderful introduction, Jaelen. I’m so proud of Jaelen, and I know you brought some other kids from Lee Hall Elementary. It’s so good to see all of you. (Applause.) Oh, they’re over there. And I want to thank your mom and your whole family for their service to our country. J.R. Martinez, it is always wonderful to see you. Thank you for your service and all that you continue to do for our military families. The First Lady and I are so excited to be here with all these military kids. I want to give a special welcome to some very brave kids from the Delaware Army National Guard 153rd Military Police Company. (Applause.) Just a few weeks ago, I was with them when their moms or dads were deployed to Afghanistan. I want you all to know that we are so proud of you and we will be here for you while your moms and dads are away. The First Lady and I knew from the start that we wanted to celebrate the strength and service of our military families. That’s why we started Joining Forces — our effort to encourage all Americans to find ways to honor and support our troops, veterans and military families. Joining Forces is especially important to me because I know something about being a military mom. Our son Beau is a major in the Delaware Army National Guard, and he was deployed to Iraq for a year. Beau has two children, Natalie and Hunter, so I know — (applause) — thank you — so I know firsthand just how important it is for a child to have everyone’s support — their friends, their teachers, and their entire community — when mom or dad is away. So we want tonight to be one special way that our country shows all of you just how much we appreciate everything you’re doing for our country. And we are so excited to be here with you tonight, here with everyone. MRS. OBAMA: Wow. Thank you so much. Thank you, Jill. Big hand to Jill, my partner. (Applause.) How is everybody doing? (Applause.) Are you guys having fun? (Applause.) Are you excited to be here for the inauguration? (Applause.) Well, we are all excited that you could join us tonight, both here in Washington and from all across the country and around the world by video. We’ve got kids from Fort Hood that are here. (Applause.) We’ve got folks who have joined us from Joint Base Pearl Harbor-Hickam. They’re in the house. (Applause.) We have folks from Wright-Patterson Air Force Base here. (Applause.) We’ve got folks from Camp Pendleton who are here with us. (Applause.) And we’ve got Coast Guard Air Station Clearwater here as well. (Applause.) Yes! Now, inauguration is a pretty big deal. The President and the Vice President are sworn in. There are all these inaugural balls, everybody dresses up and dances. We had a wonderful day of service today, and hundreds of thousands of people come from all 50 states to join in the celebration. And let me tell you, I love every single minute of it. Every single minute. But I have to tell you that my very favorite part of this entire weekend is being right here with all of you. (Applause.) Absolutely. Because for me, this is what inauguration is all about. It’s about celebrating who we are as Americans and all the things that make this country so great. And when I think about who we are, when I think about what makes America great, I think about all of you –our men and women in uniform, our military spouses, and our amazing military kids. And that’s why Jill and I wanted to host this event. And we’re not the only ones that wanted to pay tribute to all of you today. You see, when we said we wanted to host a concert to honor our military kids, let me tell you, everyone wanted to be here. Usher wanted to be here. (Applause.) Katy Perry wanted to be here. (Applause.) Nick Cannon, the folks from Glee, and all the other amazing performers — they wanted to be here, too. (Applause.) And let me tell you, they’re not here for me. They’re not here for Dr. Biden. They are here for all of you. Because they know the kind of sacrifices that you all make every single day. Let me just share something. Did you know that the — that a military kid attends an average of six to nine schools by the time he or she graduates from high school? I mean, just think about that. Just imagine how much courage it takes to always be the new kid — to walk through the doors of a new school every couple of years; to have to make new friends again and again. And did you know that our men and women in uniform often have to be away from their families for months, sometimes years. Just think about the level of maturity that is required for military kids during those times, just think about that. Think about how they have to step up at home without even being asked — taking out the trash when dad’s not there; helping brothers and sisters with their homework when mom is away. Think about how hard it is for military kids to be apart from the people they love most, how they miss their moms and dads every day and would do anything to have them back home. And that’s just a glimpse of what it means to be a military kid. It means always thinking about things that are so much bigger than yourself. It means growing up just a little faster and working just a little harder than other kids. And it means doing the greatest thing you can ever do with your life at such a young age, and that is to serve our country. So to America’s military kids, let me tell you, make no mistake about it, you all are an important part of the greatest military on Earth. (Applause.) By supporting your families, you all are helping to protect this country and keep every single one of us safe. You’re doing that. And Dr. Biden and I are so incredibly proud of you all. Every day, we’re proud of you. Let me tell you, our husbands are proud — the Vice President, the President — they are proud of you. And in the coming years, as these wars draw to an end and we draw down our troops, I want you all to know –(applause) — absolutely — but here’s the thing: I want you to know, you and your families to know that we will not be drawing down our work to support you. We will be doing just the opposite, because the fact is that today we have a greater obligation to serve you than ever before. And we will do everything in our power, everything to meet that obligation to make sure that our military families get the benefits they’ve earned and the support and recognition you all deserve. So in the coming months and years through Joining Forces, Dr. Biden and I, we will keep calling on Americans to translate the love and pride that we all feel into action that makes a real difference for you and your families. Every single one of us has a role to play here. And I encourage everyone watching tonight to go to JoiningForces.gov and find out how you can give back to our military families. Because we cannot rest, no, we cannot be satisfied until we are serving all of you as well as you’ve served this country. You all deserve nothing less. And with that, there is someone else here tonight who would like to show her appreciation for you all. She is our final performer for this evening. Should we bring her out? Are you ready? (Applause.) Are you really ready? (Applause.) All right, then. It is now my pleasure to introduce the fabulous Katy Perry!